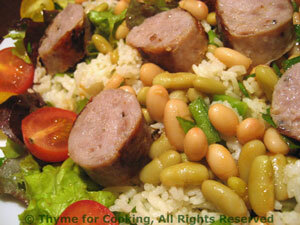 Sausage, Rice and Bean Salad, Thyme for Cooking summer salads. When done, remove from heat, fluff with fork and put into large serving bowl. Cook sausages on barbecue grill for 10 - 15 minutes or until done or in nonstick skillet for same amount of time (until done). Slice sausages into 1 1/2" (4cm) pieces. Put vinegar, ketchup, Worcestershire, garlic in small bowl and whisk to combine. Slowly drizzle in oil, whisking constantly. Toss salad greens with a bit of vinaigrette. Layer rice, beans, pepper, tomatoes and sausage on top. Drizzle with a bit more vinaigrette and serve, remaining dressing on the side.